Cloud providers must support a great variety of hardware to support the customer needs. This includes hardware that might not behave as the back-end virtualization technology expects it to, sometimes leading to problems in the created virtual machine (VM) or guest. QEMU allows the guests to use any Small Computer System Interface (SCSI) storage of the host by using two distinct paravirtualization backends that provides what it is called SCSI pass-through. The first one is virtio-blk. In this mode, available in all hypervisors, the guest uses the real storage device as a block device just to read and write data, while QEMU emulates the SCSI device internally. When running in Linux hypervisors, QEMU offers a second back end called virtio-scsi. Using this back end, QEMU proxies the SCSI communication back and forth between the guest device and the physical device, allowing the guest device to use all advanced features that the real device might implement. The gains of using virtio-scsi comes at a cost: if the physical SCSI device misbehaves or QEMU does not handle it properly, the guest is directly affected. There is an instance in which virtio-scsi does not handle the physical SCSI device gracefully, impacting the guest. 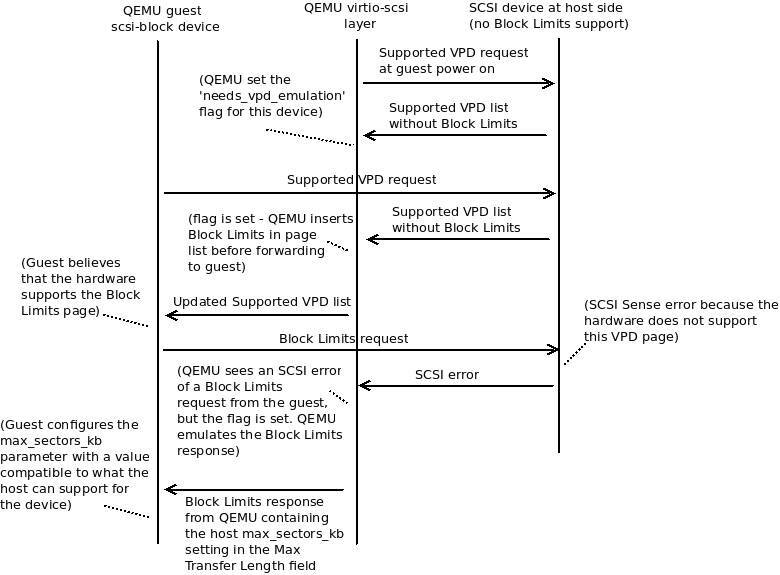 During the device setup, QEMU uses an optional SCSI feature called vital product data (VPD) Block Limits to inform the guest of the transfer limits of the physical device. Because this feature is optional, the device might not implement it. In this case, QEMU does not provide an alternative way to pass the device transfer limits to the guest, which ends up setting the transfer limit to a default value. If this default value conflicts with the actual transfer limits of the real device, the guest is unable to use it. It will send read/write commands that are larger than what the physical device could handle, causing SCSI errors in the hypervisor that will propagate back to the guest. In this article, we’ll talk more about this QEMU virtio-scsi behavior in these scenarios and how the author was able to solve it. The following section covers some basics of the SCSI standard that is necessary to understand the problem domain. The “QEMU virtio-blk/virtio-scsi with SCSI pass-through” section elaborates on how QEMU and virtio-scsi taps into the SCSI communication between the guest kernel and the physical device to allow the guest to properly configure it. “The Block Limits problem with virtio-scsi” section explains the problem and the possible workarounds for it. In “A solution using emulation” section we detail how the author solved the problem by using the existing emulation of QEMU virtio-blk back end. SCSI is a series of standards that defines commands, protocols, and interfaces to connect and transfer data between computers and peripherals. For the purpose of this article, we’re going to detail the Inquiry command only. The Inquiry command is used to request information from the SCSI device about its capabilities. On Linux, the kernel sends an Inquiry command for each detected SCSI device to query its attributes and set up them during the boot process. The enable vital product data (EVPD) bit determines whether this is an Inquiry for a specific VPD page or a standard Inquiry. If EVPD is set to zero, then a standard Inquiry data is expected. The standard Inquiry data contains information such as vendor, peripherical device type, product identification, serial number, and so on. As we can see, general information and capabilities about the device is retrieved in the response. If the EVPD bit of the Inquiry command is set to one, then the PAGE_CODE byte contains the requested VPD page. A common use is to first request the supported VPD page (page code 00h) to determine what VPD pages the device supports. Then, issue an Inquiry request for each one of them. The --vpd parameter sets the EVPD bit to one, the --page parameter allows us to specify the VPD page we want. Instead of using sq_inq and setting the EVPD manually, we can use another sg3_utils utility called sg_vpd that sets it automatically for us. It also has the advantage of being able to decode all VPD pages with one command. There are several VPD pages defined in the SCSI spec, but two of them are mandatory: page 00h (supported VPD pages) and page 83h (device identification). Any device that complies with the spec must implement at least these two VPD pages. Most devices implement more than these two pages, especially the unit serial number (80h). To provide a virtual SCSI device, QEMU will either emulate the SCSI target and just read/write in the physical block device (virtio-blk back end), or it will pass-through the SCSI messages from the virtual machine kernel directly to the real device (virtio-scsi back end). The usability problem that we want to discuss happened with virtio-scsi, thus let’s elaborate on the basic functioning of it. But to get started, we’ll briefly explain how the virtio-blk back end works for two reasons: it makes easier to understand virtio-scsi and the mechanics of virtio-blk was part of the solution we’ll discuss in “A solution using emulation” section. Simply put, this is a fully emulated back end as far as SCSI communication is concerned. The figure below illustrates how it operates. All SCSI commands responses are emulated in QEMU. For the read/write SCSI commands, QEMU will read/write the contents in the device block file in the hypervisor, emulating the SCSI reply back to the guest kernel. The /dev/disk/by/id/scsi-<id>(…) path points to a SCSI storage in the host. And, refer to the following code for its SCSI Inquiry details. However, inside the guest operational system, the device identifies itself as QEMU HARDDISK. This shows that QEMU emulates the SCSI layer for this device, presenting it as a QEMU hard disk. While emulating, QEMU will take into account, among other things, the current configuration of the SCSI device in the host. This ensures that the configuration of the emulated device that the guest will use is compatible with the configuration of the real device. One of those configurations is related to the max_sectors_kb Linux kernel parameter that QEMU set in the Block Limits VPD response. This means that any process running in the host can’t send any read or write request that exceeds 256 kilobytes to the /dev/sdb device. Because QEMU is a process in the host, this limitation also applies to the virtual machine that uses /dev/sdb with SCSI pass-through. If the virtual machine attempts to use a greater value, QEMU won’t be able to read/write the host block file, that is, the guest SCSI disk won’t be usable. This command fetches the max_sectors_kb value of the block device that the file descriptor (fd) uses and stores it in the max_sectors variable. This value is then added to the SCSI Block Limits VPD response. Block Limits is an optional VPD page that provides operating parameters such as Maximum/Optimal Transfer Length, Prefetch Length, and others. If the SCSI device supports it, the kernel requests the Block Limits page to set up the device parameters. The max_sectors_kb parameter is related to the Maximum Transfer Length value of the Block Limits response. Maximum transfer length value is set to 512 blocks. This is no accident – QEMU read the host max_sectors_kb and found it to be 256 kilobytes. One block is 512 bytes, so 512 blocks equals 256 kilobytes. This means that, from the guest point of view, the SCSI device is reporting a maximum capability that matches the max_sectors_kb setting it has on the host. The virtio-scsi back end allows the guest to directly send SCSI requests back to the real device. Its functioning is shown in the following figure. All SCSI commands responses are sent by the real device, passing through QEMU. This mechanism allows the guest device to use all the features that the real device implements. Read and write requests from the guest are also sent directly to the real device. Aside from these differences, QEMU does the same setup strategy with the max_sectors_kb parameter described in “max_sectors_kb and Block Limits VPD” section when using virtio-scsi: QEMU intercepts the Block Limits VPD response from the real device that is addressed to the guest, changes the Maximum Transfer Length field, and then forwards it to the guest. Note that, in this case, this mechanism is bounded to the support of the Block Limits VPD page by the SCSI device in the host (which brings us to the problem that we want to discuss). The Block Limits VPD page is optional – although many SCSI devices chooses to support it, its absence doesn’t hurt the SCSI specification. This has a direct impact in a QEMU guest that uses SCSI pass-through with virtio-scsi. If the SCSI device does not support it, there will be no Block Limits VPD message between the guest and the SCSI device. Without this message, there is no way to let the guest know of the max_sectors_kb setting of the host. This means that the guest will take a default value for the parameter, which can be incompatible with the host side parameter, causing the guest device to malfunction. What will happen is that the guest SCSI device will send requests bigger than what the host can handle, that is, it can’t be used to read or write. If the guest was able to boot up to the prompt, there is a way to work around this issue. Run the echo command Set the value in the /sys/block/ directory. If the max_sectors_kb parameter in the host operating system is 256, set it to the same value in the guest operating system. This process can be automated to persist guest restart. An alternative method is to add the echo command in the /etc/rc.local file in the guest operating system. In this example, this is done for a /dev/sda SCSI device in the guest operating system. You can also use udev rules to achieve this. However, adding the echo command in the /etc/rc.local file is an alternative method. This impacts all the SCSI devices that use this controller. You can use this approach when you want to install a new operating system that uses a SCSI pass-through disk that is affected by this issue. To echo the right value to the /sys/block/ directory during a guest install operation, you must access a system terminal during the installation process and change the value of the max_sectors_kb parameter before the installation starts to write in the disk. Hence, you can set the value in libvirt. If the guest operating system is already installed, the approach described in the first method is less restrictive because it does not affect other devices. Note that there will be times (a guest installation uses the virtio-scsi device and there is no way to set the parameter beforehand) that even these workarounds won’t suffice. In this case, the user would need to either remove the virtio-scsi disks or use virtio-blk instead during the install process. If a change in max_sectors_kb is made in the host side, manual change in the guests will also be required. During an OS installation, it is difficult (and sometimes not possible) to go to a terminal and change the max_sectors_kb parameter prior to the installation. A better way would be to fix this situation from inside QEMU. The author proposed a fix that relies on the already available emulation from virtio-blk and adjustments in the virtio-scsi back end, allowing the guest to query for the Block Limits page even when the SCSI hardware doesn’t support it. we’ll go through the concepts of the developed solution now. To fix the max_sectors_kb issue with virtio-scsi, using the existing mechanism described in “max_sectors_kb and Block Limits VPD” section, the guest must always query for the Block Limits page regardless of the hardware supporting it or not. There is no way to make the guest aware of the proper setting otherwise. However, all SCSI messages are proxy to the real SCSI hardware, which isn’t aware of what QEMU wants to accomplish. In a reply to an Inquiry message fetching the available pages, the real device will only advertise the Block Limits page if it supports it. As seen in “SCSI Inquiry command” section, to query all available pages, an Inquiry message with the EVPD bit set is sent to the device. The format of the reply to this Inquiry request is shown in Figure 4. Byte 3 indicates that the length of the page list is 3 bytes. Byte 4 up to 6 contains the list, which is 00 (supported VPD pages), 80 (unit serial number) and 83 (device identification). This response passes through QEMU untouched and the guest will never ask for the Block Limits page. But we want the guest to ask for the Block Limits page even if the hardware doesn’t support it. But, because we know how the guest will interpret it, we are able to change the response before it is delivered, adding the Block Limits in the page list. For each Inquiry with EVPD set response QEMU receives, check if the page b0h (Block Limits) is in the page list that is returned. If it is present, there is nothing to be done. Otherwise, we’ll add *b0 at the end of the page list and increment the page length information (byte 3). * In this case the problem doesn’t occur – the hardware has Block Limits support and everything work as described in “max_sectors_kb and Block Limits VPD” section. /* See if Block Limits page 0xb0 is supported by the hardware. * thus page_len + 4 is the total size of the buffer. Doing this change, the guest will be aware of Block Limits support, but the max_sectors_kb value is still wrong if the SCSI device does not support it. The guest will send Block Limits requests to the device and will get an error. We can see this behavior by fetching the available VPD pages and trying to get the Block Limits information inside the guest. This is expected and will be handled by emulating the Block Limits VPD response. In section “virtio-blk“, we saw that the virtio-blk back end emulates all the SCSI replies that are sent back to the guest kernel. We also verified that QEMU implements the Block Limits VPD page in this case. This means that we already have code inside QEMU that can be used to solve the problem in virtio-scsi. If the guest sends a Block Limits response and an error is returned from the hardware, we can deliver an emulated Block Limits reply from the virtio-blk code, which has the max_sectors_kb parameter already considered, and the guest can properly set up the device. Note that this will only happen if the guest knows about the Block Limits support, meaning that we’ll need to make sure that we advertise it all the time using the code we discussed earlier. The author took a step further in the final version of the fix that was accepted in QEMU. Instead of checking every Inquiry EVPD message, QEMU will fire an Inquiry supported VPD page request to the device right after the virtual machine starts. If the SCSI device does not advertise Block Limits support, an internal scsi-block flag called needs_vpd_emulation is set. This flag is then checked every time an Inquiry reply or a SCSI error comes from the hardware to QEMU to see if this is a case of either changing the Inquiry reply or emulating the Block Limits page. A QEMU guest may have several scsi-block devices at the same time, and this flag allows a single verification at machine start for each scsi-block device instead of doing it for every Inquiry response or SCSI error. (Refer VPD Block Limits emulation implementation for more details.) Figure 7 illustrates all messages and events related to the fix that is available publicly in QEMU. The max_sectors_kb issue found and fixed in QEMU is an example of how flexible and robust virtualization technologies must be to support a great array of hardware, aiming to provide the best service available to customers. The idea of using the Maximum Transfer Length field to insert the max_sectors_kb value of the Linux host andallowing the guest to properly set up the SCSI device is ingenious. But, this couldn’t fix all cases because it was reliant of hardware support for an optional VPD page, something that we can’t take for granted. The work reported in this article, covering this corner case, makes the QEMU virtio-scsi layer more robust and convenient for users of SCSI pass-through devices.